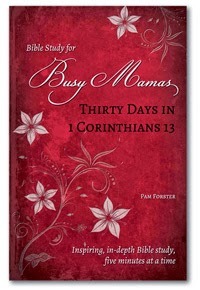 Bible Study for Busy Mamas: Thirty Days in 1 Corinthians 13 by Pam Forster of Doorposts is written with the busy homeschool mom in mind. This book especially addresses things homeschool moms will identify with, and it breaks down Bible study in increments that complement the homeschool lifestyle. That is just one of the things that make this book special. This volume of Bible Study for Busy Mamas is an in-depth study of just one chapter of the Bible. In five minutes a day, this study takes about one month to complete. With a little time each day, This book helps you understand God's Word better and prepares you to put these lessons into practice in your homes. Mrs. Forster points out that a small amount of time devoted to Bible study will make us better mothers and is essential to equipping us to nurture our children. Bible Study for Busy Mamas is divided into thirty short readings with assignments for digging deeper into the thirteenth chapter of the Book of 1 Corinthians. Along with this book, moms will need a Bible, a pen, and paper or a notebook, preferably gathered together in a place where they can study. If everything is ready, it will be easier to steal away five minutes of time. My favorite thing about Bible Study for Busy Mamas is that it is not overwhelming, and it is a great starting point for women who are new to Bible study. This book helps moms develop a habit of spending quiet time in God’s Word, and after completing the study of 1 Corinthians 13, they will be able to move on to further Bible study on their own. Mrs. Forster provides guidelines for further studies in the appendix as well as on her website (www.doorposts.com/blog). I like how Mrs. Forster breaks everything down and makes it achievable, and she even includes “catch up” days. With the exception of a couple of assignments, the daily assignments really can be done in the five minute time allotment. However, if moms are able to set aside more time, the study becomes even more enriching.